As you may or may not have noticed the folks from WordPress.org have removed the iQ Block Country plugin from their plugin directory. The iQ Block Country plugin relies heavily o: the MaxMind databases. These databases are distributed under the Creative Commons Atribution-ShareAlike 3.0 license while WordPress itself is licensed under the GPL license. And these 2 licenses conflict with each other. Therefor WordPress requires the iQ Block Country plugin to not automatically download the Maxmind databases or allow users to do so with for instance a download button. You as the end user should download the Maxmind databases manually and upload this file to the WordPress directory via FTP or similar ways. But there is a catch to this. 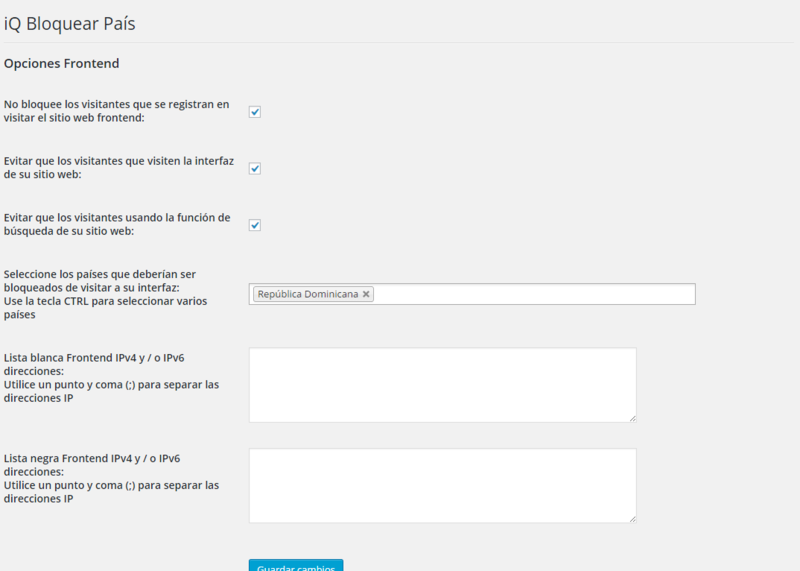 The iQ Block Country plugin should work even without you uploading the necessary databases the plugin needs. So even if I build a version that does not download the databases there is a good chance the plugin will be removed again as it requires the same databases that I am not allowed to require. So despite it is logical that the two licenses conflict I am now at contemplating what I should do with the development of this plugin. Remove the automatic download from the plugin and put it back up with good instructions on how you can upload the databases. But this includes the risk the plugin may be removed again due to requiring things it is not allowed to require. Add another GPL compatible database (if any exist) next to the one that Maxmind provides making it so that the plugin does not rely on the Maxmind database. The latest version can still be downloaded here. What are your thoughts on this matter? Please leave a comment! Update 06 March: The plugin is available on the WordPress plugin website again. I would just remove the automatic download of the maxmind DB’s with an explanation of how to download them manually, and see if that will satisfy the folks at WordPress, and i do hope it does, because it’s rather pathetic that they disallow plugins that don’t use 100% GPL components, considering the staggering amount of paid themes and plugins they have on display. I’d hate to see development of this plugin cease alltogether, as it has kept my blog spam-free (the amount of blacklisted IP’s i pulled from the logfiles in just three days is shocking, and this is for a simple blog run off a Raspberry Pi :-O ) , and it’s helped stop one attempt at using a PHP exploit on the front end (it wouldn’t have worked, but still, keeping these folks from even reaching that stage gives me some peace of mind). The reason apparently is that the folks at WordPress can be held responsible if they allow the automatic download of the GeoIP databases as they cannot enforce the attribution part of the license that Maxmind has for the free database. Either way there are still a lot of plugins up there who also rely on the maxmind database and some other plugins have also been taken down. But having read up on similar problems that have come up before with plugins and licenses, i’ve got this sneaking suspicion that they won’t leave it at that. I don’t even want to imagine how much work i’d have manually cleaning out that many junk replies and account creations. Your plugin saves us a huge amount of work and reduces hack attempts on our server to a very large degree. Please! whatever happens, don’t stop the development. Thanks. I am creating a “you have to download the Maxmind DB” manually version so it is listed on the wordpress plugin site again. Hi Pascal, While downloading them manually and installing them has worked perfectly, it’s very time consuming to do this manually every week in order to keep the database up to date. Might I suggest a solution please……. Keep the option to manually download and install the database as you have now…. Which then allows the plugin to be hosted on the wordpress site. But then write a separate plugin that is only available to download from your own web site. Which is specifically designed just to download and install the GEO-IP Databases automatically. It’s then not part of the software that is being distributed on the WordPress Site… And if it’s optional whether perople download the databases manually (as required by WordPress licence) or use your separate “automatic database updater” plugin, which would not need to be on their site. There would be no licence conflict. Do you think that would be possible?? I’ll consider writing such a plugin. v1.1.17 was just commited to WordPress. The plugin now needs to be checked so I am not sure at the moment when it will be back up again. I downloaded the two files and uploaded to the uploads folder as directed by your plugin’s popup message. Nothing has happened, and the warning is still there. I downloaded the new version as well as the GEO-IP Database and installed it exactly where you said to. The unfortunate result was that I was no longer able to loginto my site. I had to revert to the previous version and now am left without any durrent IP info. What do I do now? I feel uncomfortably without the IP database but other plugins seem to be able to use it…..why not you? Other plugins were taken down as well from the WordPress plugin site. Others might be taken down on a later stage. I wish I had an older release featuring the auto-download. I would extract the auto-update-code into an seperate plugin, which I would not distribute via WP or not distribute at all, but leave on my WP installations. I use Your plugin on a few websites of local businesses, where visitors should by 99% come from Germany. I have a better sleep, knowing that Your plugin reduces possible attacks, which I mainly see being started from i.E. China or South America. @All: If You have a server and are able to set cronjobs, You can automatically update it this way.. Call the .sh in Your cronjob and You’re done! Hello, I have followed the instructions but am still unable to get this plugin to work. I downloaded and then uploaded but still I am seeing tons of hits to my site from other countries that I have blocked. It shows in the records that it is blocking some, not sure though as there are others from the same countries not being blocked. Any help much appreciated! Just letting you know that because there is no option to update the database from within WordPress, I’m switching to a different plug-in. It’s too much of a hassle to update manually and because of that, we keep getting visits from blocked countries now. It was no longer allowed to include a download button or an automatic download by the WordPress devs so unfortunately I had to remove that option. But if you like you can use the GeoIP API or use a MaxMind database download plugin that is not available from the WordPress Plugin site. I loved this plugin until it stopped working for me. I removed it from one of the sites I managed and recently installed it again. After I followed the instructions for downloading the data base, I have the paragraphs starting with “The MaxMind GeoIP database does not exist…” along with instructions on how to download and install. This is a hassle. And since no hosting companies provide country blocking on their end, a product like yours would be excellent…if it worked. Without the databases added manually, countries are accessing this site regularly. Are you going to update for WP 4.2.2? I hope so. I am sorry I do not speak Spanish. If you see visitors from the Dominican Republic in your google analytics or another statistics plugin that may happen. As log as you see people blocked from the Dominican Replubic on the “Logging” tab you’re fine. Pascal, is there a way to have a central GeoIP.dat file to be shared amongst numerous wordpress sites on the same server? I have answered my own question. do you know if proxy servers are blocked aswell? Is there a plugin that can take care of that. Proxy servers can be blocked. But the plugin will always try to detect the real ip address from the visitor. If that address is not available the proxy ip address will be used. And as long as the country that is registered to the proxy is blocked the request will be blocked as well. How often to the databases update, and where can I get notifications and download them when they do? MaxMind updates the database(s) once a month. Every first tuesday of each month a new database is available. You’ll have to add a notification in your agenda if you want to update each month I guess. “However, last month, Creative Commons finally stepped up. CC-BY-SA 4.0 is now compatible with the GPLv3. I find your plugin working great, and the manual upload of geoip.dat was easy enough. I was wondering though, cause it seems that WP statistics is allowed to perform an automatic update of the database? My plugin was removed from the WordPress Plugin Repository because it included an auto download of the databases which did not comply with the license of WordPress. As Mark Rudder Said: you can now use CC-BY 4.0 and CC-BY-SA 4.0 licensed code or images or anything else in the WordPress.org plugin and theme directories. Because they have been brought in line with the GPL. So there is no longer a problem with including automatic updates of the Maxmind database.. You might need to check this further with the WordPress Devs… but as far as I can see it does mean that you can legitimately re-instate auto updates.